We have had a couple of nice, relaxing weekends. Last weekend (Oct. 22-24th) was the best! We did NOTHING but relax. Leif and I went to Jakob's Parent/Teacher Conference. That turned out well. He's tested above average nationally so far. That's nice, of course. I was able to spend time with a good friend after the meeting. Leif went home to do homework (so I thought.) It was so nice to visit with my friend for a while. And then when we came home, I found that Leif had straightened the house and done the dishes. Ahhh, Heavenly! That made it possible for me to relax the whole weekend. We watched movies and ate yummy food all weekend. We watched Ice Castles (good Show), Minority Report (not going to watch again), and we introduced Jakob to Star Wars (of course that was a hit!!) We started watching the documentary called BABIES on Netflix (didn't finish because the Internet router went out.) I was also able to read a great book by Shannon Hale called Book of a Thousand Days. I read her book titled Princess Academy earlier and really enjoyed it. 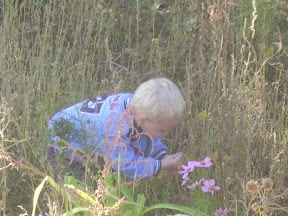 Here are a few pictures of our baking projects and Caleb wandering through the overgrown wild flower garden now heading into Autumn sleep. Wonderful Family Time! This weekend we were supposed to go to my parents house and to one of their Murder Mystery shows. We were also going to visit with Leif's sister and her family,and my good friend from high school and her family. We were all looking forward to it. Then Caleb came down with his monthly fever. This fever hit 103 degrees. So, we had to cancel all of those plans. Instead we stayed home. We were going to vegg like last week. The boys watched Star Wars pretty much all day Friday. That night we we enjoyed the company of Leif's parents and his brother Erik and his wife Stacy. The boys had a melt down around 7:00 so they had an early bedtime. 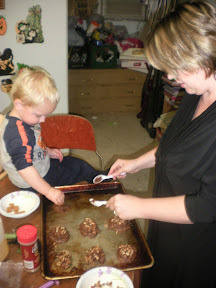 After we put them to bed Leif and I were able to have an adults night out, YIPPEE! Leif's mom made us homemade spice cake donuts MMMM! We stayed up late and played a game of Domino's. It was so fun but I was EXHAUSTED! The next morning Leif and his mom made crapes, bacon, and pumpkin muffins for breakfast. WOW! 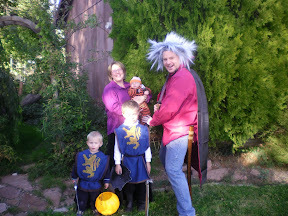 I then went upstairs and finished the boys Halloween costumes. 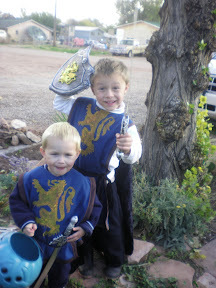 I made them each a Knights costume. It was a lot of work, but a lot of fun too!!! Leif gave me a sewing machine for an early Christmas present and I have loved tinkering with it! 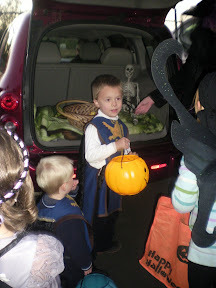 I didn't mention, but Thursday was Jakob's Kindergarten Halloween parade. I took the little boys and we met Leif for the parade and then had lunch with Leif. Good Times! 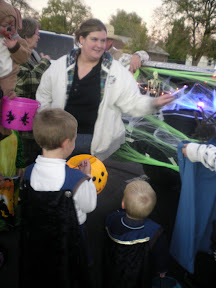 Saturday evening we all got dressed up and went to the church parking lot for a Trunk r' Treat. What a great time! We had a chili dinner and harvest desserts with hot chocolate. 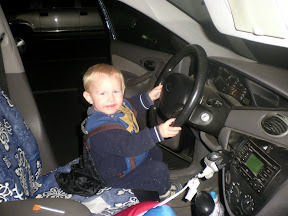 Then we took the kids around to the cars for goodies. It was really fun to all be together and have a lot of festive fun. Caleb won all of us that night by eating too much candy. It became impossible to monitor how much he was eating. His fever had calmed down by then but he was still crabby and not willing to take no for an answer. Well, we paid the price. Leif had to clean up a mess in the middle of the night (while I fed JJ) Caleb threw up. Such a good man! So Sunday morning came upon us and there was no way I was going to be able to go to church. I HAD to sleep and rest more. So Leif stayed home with me and Caleb was able to rest with us as well. Jakob went to church with grandma and grandpa. Leif's mom called us over for left over chili dinner and I just sent Jakob down to deliver dessert to them Magic Cookie Bars MMMM! So, though it would have been a lot of fun to head north. It was actually a good thing we stayed. I didn't mention details about Caleb's antics while down in the dumps. But let's just say too much driving, and fewer naps would have been really hard. Oh, before I forget, in the middle of this past week Leif took the TEAS test in preparation for his Nursing Program application. He scored 96%. AWESOME! Especially for it being the first time taking the test. They allow someone to take the test up to 3 times per year. So, there it is. I think I covered everything. We made some great memories and have enjoyed the last couple of weeks. Things sound pretty good there (well minus getting sick and throwing up). Have you read Shannon Hale's "Goose Girl"? It's a good one too. Hope you all have a good week coming up! Great job on the costumes they both look great. So fun to have a good sewing machine. Dairus says cool for Leif on the test. Love all the pictures. I have decided I really like Trunk or Treat over door to door. Man you are the fourth mom I've talked to that has had sick kids this Halloween. Glad you were able to do some of the fun festivities though. I love their costumes, very cute. 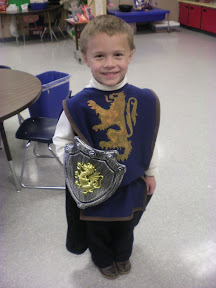 K - Jakob is absolutely handsome in that Knight costume! And you made it yourself - I'm seriously so impressed. Again, sad that we didn't get to see you :( Hope you're feeling better!